after terrorists bombed a stage. the 1935. Then he won the second in 1936. Outspoken Scot Robert Millar charged the Spaniards with collusion when they banded together in 1985 to “prevent” a foreign victory, instead ensuring “oro” for Pedro Delgado. While Winston Churchill was trying to rally an indifferent Great Britain and America to prepare for the ‘Gathering Storm', evil forces were at work. In 1934 Hitler had become Fuehrer on his path to building a Nazi Germany. In Spain General Franco spent the 1920's and 1930's establishing his power base to eventually become the Fascist dictator of that country until his death in 1975. The origins of the Spanish civil war can be traced back to 1923. The civil war proper broke out in 1936 and ended in 1939. Today it seems incredible that saner people living in those difficult times could think about organizing a bike race. Yet in 1935 a newspaper (the Diaro Informaciones) organized with Clemente Lopez Doriga, the Henri Desgranges of the Vuelta a Espana, and launched the first Vuelta a Espana. From this point of view the stimulus (newspaper circulation) for the event mirrored the beginnings of both Tour de France and the Giro d'Italia. From 1935 until 1955 the race struggled to survive as war, deprivation and an impoverished Europe took their toll on the race . As an additional challenge, the fledgling Vuelta was always run at around the same time as the Giro. Consequently many of the best foreign riders would choose Italy as their destination. This firmly placed the Vuelta as the third and least prestigious of the Grand Tours. It was not until 1995 that the organizers agreed to move the Vuelta to its current August/September calendar slot. Not only has the Vuelta benefited immensely from this move but now the pro peloton can plan around three well spaced out Grand Tours. Franco and Hitler had bitter disagreements about Spain's participation in the war (WWII). As a result Spain refused to join Germany and thus stayed out of the war. This fact had enabled the 1941-42 editions of the Vuelta to take place. By 1943 world events had become so tumultuous that it was impossible to organize such an event and naturally foreign participation was down to zero. The Vuelta returned in 1945 and ran annually until 1948. 1949 no race, back again in 1950 and then no more events until 1955. Since 1955 there has been an unbroken annual string of events. The immediate post war period was one of great hardship. Spain had torn itself to shreds with a Civil War that fostered an enduring legacy of hatred. It is therefore a tribute to the human spirit that the Vuelta could be organized and that riders were ready to compete at all during these challenging times. In more recent times the race almost fell victim to terrorists in 1968 when a bomb exploded on the road to Pamplona. The stage that day was neutralized but happily the Vuelta continued the next day without further incident and Italy's Felice Gimondi took an impressive overall win. As the 1970's drew to a close the Vuelta was once more facing extinction when the organizers of the 1979 race resigned just three months before the scheduled start. The race was rescued and an uninspiring race saw Holland's Joop Zoetemelk take top honors. For the Spanish people the most significant post-war event was the death of their dictator Franco in 1975. This led to the first democratic elections in 40yrs in 1977 and since then Spain has evolved into a thoroughly modern democratic nation, proud, elegant and rich in cultural history with a Grand Tour worthy of its place beside Le Tour and the Giro. 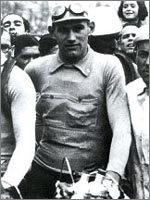 The first rider to claim the overall golden “Oro” jersey was Gustav Deloor of Belgium following a tremendous battle with the Spanish rider Mariano Canardo in 1935. Similar to the early TdF's, this first Vuelta comprised ten monster stages longer than 250km's and four shorter stages. Deloor again took the second edition of the Vuelta in 1936. However the situation in Spain during that April was so tenuous that the start of the race was in question up until the last minute. Understandably the race was a muted affair with most of the population more concerned about the impending outbreak of war. Yet the race did uncover a tremendous new Spanish talent in Julian Berrendero who developed into Deloor's main opponent. A few weeks after the Vuelta finished (July 1936) the Civil War erupted and Spain was plunged into a terrifying and bloody nightmare. Berrendero, who was in fact doing his military service during the 1936 Vuelta, was taken prisoner during the war and languished in several concentration camps. At the time he thought that this was the end of the road, but he not only survived as he came back and won both the 1941 and 1942 versions of the Vuelta. 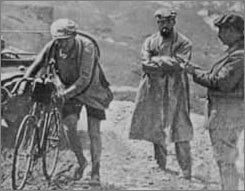 Considering the way that today's athletes prepare and live a pampered life, it is astounding that riders of Berrendero's generation could survive war and unimaginable hardship as a prelude to participating in Grand Tours. One characteristic of each Grand Tour is the ‘in-fighting' between the nationals in their own home country race. It is a matter of honor and pride to win in your own country. In this respect the Vuelta has had more than it's share of bitter local rivalries. As a result, these conflicts have tended to deliver the race to foreign participants. For example, in 1958 a personal feud between potential winners Bala and Lorono opened the door for France's Jean Stablinski to take the race. ‘Eternal second' Raymond Poulidor always played second fiddle to Anquetil. In 1964, and with Anquetil back in France, Poulidor benefited from another case of Spanish in-fighting. Perez Frances, Manzaneque and Otano were all considered legitimate candidates for victory but their bitter personal battles enabled the great Poulidor to claim a beautiful victory. 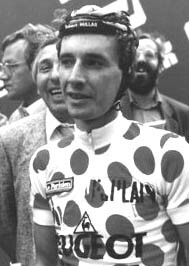 In 1985 Scotland was heading for it's first Vuelta win as Robert Millar entered the penultimate stage of the race with over six minutes advantage. 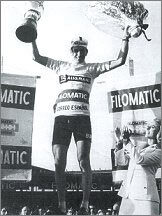 In stark contrast to historical behavior, Spanish riders formed a vicious combine to rob Millar of his leader's jersey to put Pedro Delgado on the winner's rostrum. In 2002 we witnessed the spectacle of eventual race winner Aitor Gonzalez attacking his own teammate Oscar Sevilla. Gonzalez denied the charge but this was clearly a case of rivalry within one team and clear for all to see. Two of Spain's greatest champions failed to meet the expectations of their adoring public. Probably the strangest situations surrounded the great Spanish climbing champion Ferderico Bahamontes (known as the Eagle of Toledo). Winner of the Tour de France in 1959 and six times winner of the TdF mountains jersey King of the Mountains classification , great things were expected of him in his own National Tour. In 1956 emotional outbursts and petulant behavior destroyed his time gains and lost him the race. Again in 1960 Bahamontes placed himself at the center of controversial situations and literally gave the race away. Spain's favorite son and the greatest Spanish cyclist of the modern era, Miguel Indurain, followed in the wheel tracks of Bahamontes and was never able to win his own country's Grand Tour. He dominated the Tour de France for five years (1991-1995). 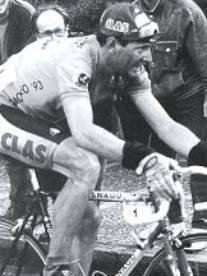 Yet in the 1991 Vuelta he was beaten at his own specialty, time trials, by compatriot and overall winner Melchor Mauri. Like his successor Armstrong, Indurain could not replicate his TdF form or mental drive to repeat his mid-summer brilliance in the Vuelta. For Spain and cycling fans around the world 1996 saw the demise of Indurain, after failing to take his sixth Tour he started the Vuelta but sadly abandoned on stage 13 and closed down his brilliant racing career. Franco still ruled Spain but the 1960's and 1970's were a period that saw the Vuelta building in strength and status. This was first underlined when the great Jaques Anquetil lined up to start the 1962 edition. The eventual first five-time winner of the TdF was all set to take the race when gastric problems set in. He eventually abandoned the race , which was won by his teammate, the great German champion Rudi Altig. Hailing from Normandy in France, Anquetil was an intensely proud man with an aristocratic air. He returned to Spain in 1963 where he controlled the Vuelta from day one and held the leaders jersey throughout the entire race. During the 1970's the Vuelta was dominated by some of the greatest champions of the sport. One of the greatest of Spain's long line of mountain climbers, Jose Maria Fuente, won in 1972 and 1974. The 1972 edition also saw Fuente's KAS team repeat their 1966 performance whereby they dominated every category in the race. In 1973 Eddy Merckx of Belgium took his only win in the race but he was challenged the entire race by Spain's magnificent Luis Ocana. Belgium's Freddy Maertens rode roughshod over the race in 1977 seemingly intent on totally dominating the race. He led from start to finish and won an incredible 13 of the 20 stages in the process. The 1980's introduced new international winners with Columbia's climbing wizard Luis Herrera's victory in 1987 and, the hardest of the hard men, Sean Kelly claiming the 1988 race for Ireland. Scandal rocked the 1982 race when two days after the final stage overall winner Arroyo (along with three other riders) was proven to have taken banned drugs. Arroyo was stripped of his win which was then handed to Spain's Marino Lejarreta. Many consider Hinault's 1983 win to have produced the best Vuelta ever. Under intense competitive pressure, it drew the absolute best out of Hinault which resulted in imperious performances from several of the leading riders including Hinault himself. Tony Rominger (Switzerland) established himself as the record holder of Vuelta wins by taking out the 1992, 93 and 94 editions. The recently retired Laurent Jalabert (France) claimed 1995. 1996 and 1997 were taken by yet another Swiss rider, Alex Zuelle. In 1997 the race made its first start outside of Spain in Portugal's capital of Lisbon. Today the race is a mature well orchestrated event worthy of its Grand Tour title. Many people try to position it as second or third behind the all conquering TdF. In reality each Grand Tour has its own character that very much reflects the culture and temperament of its host country. The Vuelta is no harder or easier than its Grand Tour cousins. The course, the terrain, the weather, the competition and many other factors dictate the severity of each race. Normally, only the world's very best riders will land on the final podium and in getting there the race will deliver tremendous racing performed over beautiful roads, past spectacular architecture and across awe inspiring climbs. For 2005 the race holds special significance due to it's inclusion in the UCI's Pro Tour and thus offers a wealth of Pro Tour points earning opportunities. Photos courtesy of LaVuelta.com .